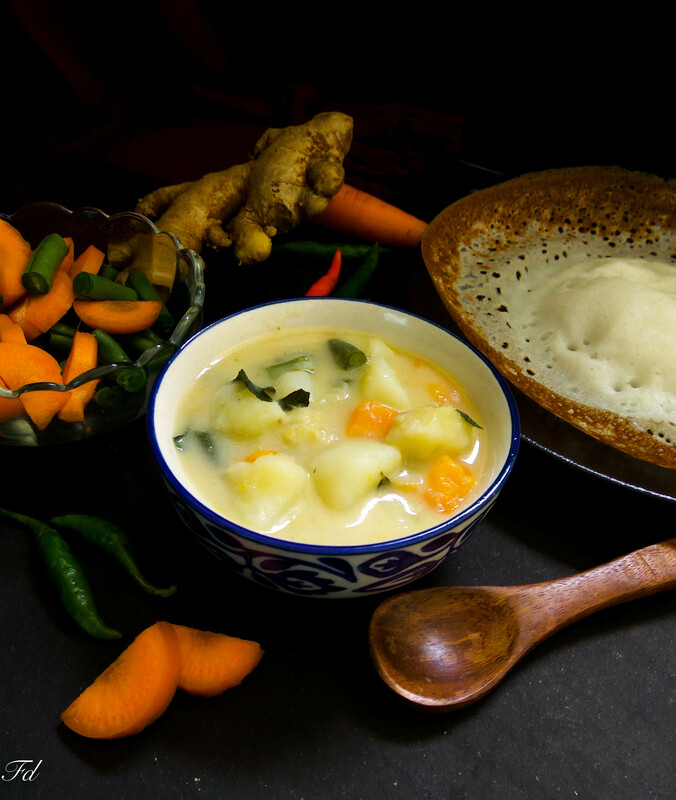 Kerala style vegetable stew is vegetables cooked in coconut milk gravy and adding some mild spices to it. A very rich yet subtle dish to be served for breakfast. In a pressure cooker add vegetables with salt and thin coconut milk (2nd extract) . Cook vegetables for 1 whistle. Mean while in a small frying pan heat coconut oil ,add ginger and green chilly. Fry in medium flame. Once the cooker cools open to add fried ginger and green chillies with thick coconut milk. Switch the gas to low flame and simmer for few seconds (do not boil) and switch off the flame. Finally add coconut oil mix well . *Add vegetables of your choice try variations by adding cauliflower, boiled and squeezed soya chunks etc. *Vegetables can be cooked by adding only water ,and finally adding thick milk alone . *You can prepare fresh coconut milk by grinding grated coconut in and extracting thick milk and adding lukewarm water to it exact thin milk. *Switch off the gas and add coconut oil this will give a tempting aroma to the dish. FOR Kerala Appam Recipe Read here.